Sheffield Pike forms the boundary between the Glencoyne and Glenridding valleys, on the western shores of Ullswater. Geographically it forms the eastern edge of a long ridge that runs from Stybarrow Dodd down to Ullswater, over White Stones and Nick Head to the lake. This western link is the only connection to other high ground and there is a significant dip between Sheffield Pike and the climb up to Glencoyne Head, so the fell feels like it stands slightly alone. The fell has four very different characters. To the north and south it presents steep and craggy slopes to the neighbouring valleys. Above these crags is an undulating area with rocky outcroppings that slopes down to Heron Pike. To the west are less interesting grassy slopes that drop down to Nick Head and the ruins of the mines. The most attractive part of the fell are the eastern ridges, dropping down to Ullswater. Here there is a mix of forest and crag, and the only flaw is the lack of a consistently good footpath alongside the lake (there is a permissive footpath for part of the way, but in places the walker is forced onto the road). If coming from Glencoyne follow the path past Seldom Seen. Where this crosses the wall onto the open fell there are two choices - head west below Black Crag and across Bleabank Side to reach Nick Head from the north, then turn left and follow the path up to the summit or head south following a wall that runs below the eastern crags of the main part of the fell until a clear path branches off to the right. Follow this path which brings us past Heron Pike and up to the summit from the south-east. From Glenridding the choices are similar. To reach the summit from the west head up the valley, past the Youth Hostels and the main mine workings, turn right onto a path that zigzags past Stang End then look for a right-hand branch heading up towards Nick Head - turn right at the pass. To approach from the east look for a path that leaves Glenridding village to the south-east of Blaes Crag, cuts above the crag and follows the ridge to Heron Pike and then onto the summit. 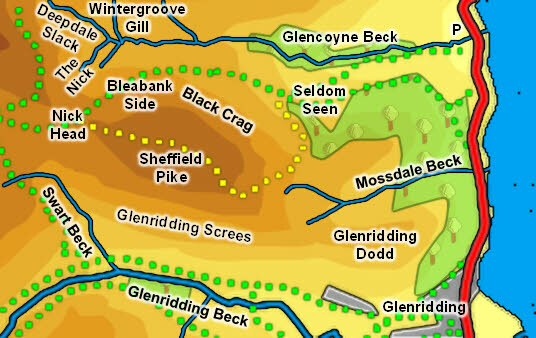 We have an ascent of Sheffield Pike from Glencoyne, climbing up the eastern end and down the west, and returning along the full length of Glencoyne. The main summit is a rocky outcropping in the middle of a mixed area of rock and heather, and feels rather isolated. Better views of the Ullswater area are to be had from the top of Heron Pike (reached by a brief diversion from the eastern paths or a rather more time consuming walk from the summit). As a result the best ascents of Sheffield Pike take the form of a round trip, heading up one end and down the other. Sheffield Pike is linked to high ground in the west at Nick Head. A small back called The Nick flows north from Nick Head, forming the boundary with the eastern edge of Stybarrow Dodd. The Nick flows into Glencoyne Beck, which forms the northern boundary of the fell all the way to Ullswater. Dropping down the southern slopes from Nick Head we reach Swart Beck, which runs through the industrial ruins above Glenridding. This flows down into the valley bottom and joins Glenridding Beck, which forms most of the southern boundary. Two ridges run east from Sheffield Pike towards Ullswater. The northern of these is clearly part of Sheffield Pike, but the southern ridge rises up to form Glenridding Dodd. The beck between these two ridges, Mossdale Beck, thus forms an east-flowing boundary of the fell, while the nameless beck that flows south from The Rake into Glenridding forms the south-eastern boundary. Sheffield Pike has no named tarns, but there are scattered pools above Heron Pike, at the south-eastern corner of the upper, flatter, part of the fell. The south-western corner of the fell is dominated by the ruins of lead mines, so as always with mining areas take care if you head away from the path.